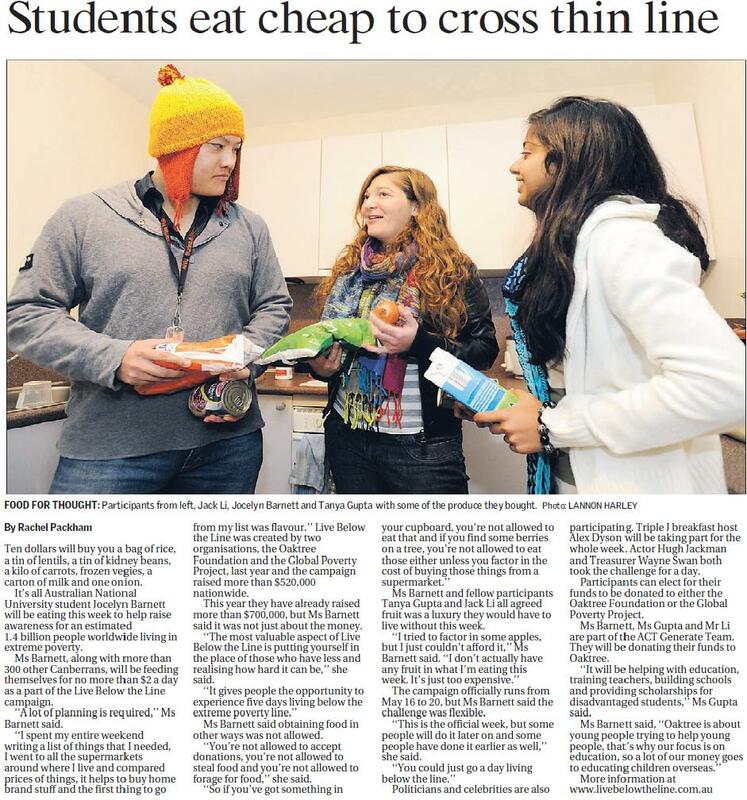 My first published story in the Canberra Times. Read on Canberra Times website here. Ten dollars will buy you a bag of rice, a tin of lentils, a tin of kidney beans, a kilo of carrots, frozen vegies, a carton of milk and one onion. It’s all Australian National University student Jocelyn Barnett will be eating this week to help raise awareness for an estimated 1.4billion people worldwide living in extreme poverty. Ms Barnett, along with more than 300 other Canberrans, will be feeding themselves for no more than $2 a day as a part of the Live Below the Line campaign. ”A lot of planning is required,” Ms Barnett said. ”I spent my entire weekend writing a list of things that I needed, I went to all the supermarkets around where I live and compared prices of things, it helps to buy home brand stuff and the first thing to go from my list was flavour.” Live Below the Line was created by two organisations, the Oaktree Foundation and the Global Poverty Project, last year and the campaign raised more than $520,000 nationwide. This year they have already raised more than $700,000, but Ms Barnett said it was not just about the money. ”The most valuable aspect of Live Below the Line is putting yourself in the place of those who have less and realising how hard it can be,” she said. Ms Barnett said obtaining food in other ways was not allowed. ”You’re not allowed to accept donations, you’re not allowed to steal food and you’re not allowed to forage for food,” she said. Ms Barnett and fellow participants Tanya Gupta and Jack Li all agreed fruit was a luxury they would have to live without this week. The campaign officially runs from May 16 to 20, but Ms Barnett said the challenge was flexible. ”This is the official week, but some people will do it later on and some people have done it earlier as well,” she said. Politicians and celebrities are also participating. Triple J breakfast host Alex Dyson will be taking part for the whole week. Actor Hugh Jackman and Treasurer Wayne Swan both took the challenge for a day. Participants can elect for their funds to be donated to either the Oaktree Foundation or the Global Poverty Project. Ms Barnett, Ms Gupta and Mr Li are part of the ACT Generate Team. They will be donating their funds to Oaktree. ”It will be helping with education, training teachers, building schools and providing scholarships for disadvantaged students,” Ms Gupta said.